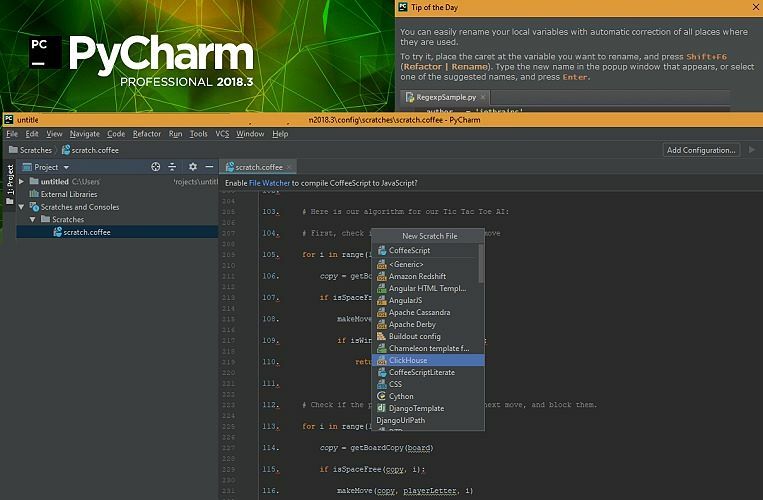 PyCharm by JetBrains is quite popular and works like a “charm” for Python developers at all levels of expertise. Intelligent features include a code-completing editor which gives context-aware suggestions as you type. You can indent automatically, detect duplicate text, and check highlights for errors. Also, there are smart search features to search for every single word in a jiffy. Apart from Go-To’s, there is a Lens mode to hover near text, and you can even bookmark it to go back later. Of course, an IDE with so many smart features is not cheap and will set you back by $200/user. However, that is only the first-year cost, and from the third year you can expect to pay $119/user. PyCharm is excellent for the ultimate professional. The learning curve is minimal, and you can find a complete set of tutorials on the JetBrains website. If you’re willing to forgo a little convenience for something open source and free, PyDev offers a useful interface. Remember that it comes with Eclipse, which is available separately. 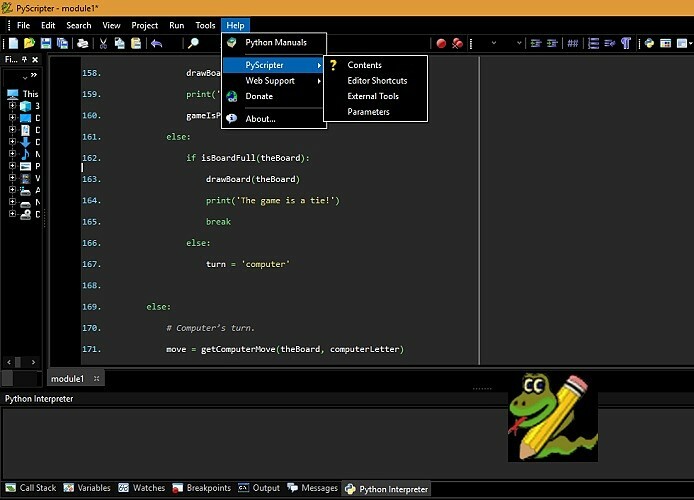 For a free IDE, PyDev is not lacking smart coding features. These include automatic code completion, smart indents and block indents, highlighting matching brackets, simple search and a debugger. Furthermore, all necessary features are available in the navigation menu itself, and you can analyze your codes easily. 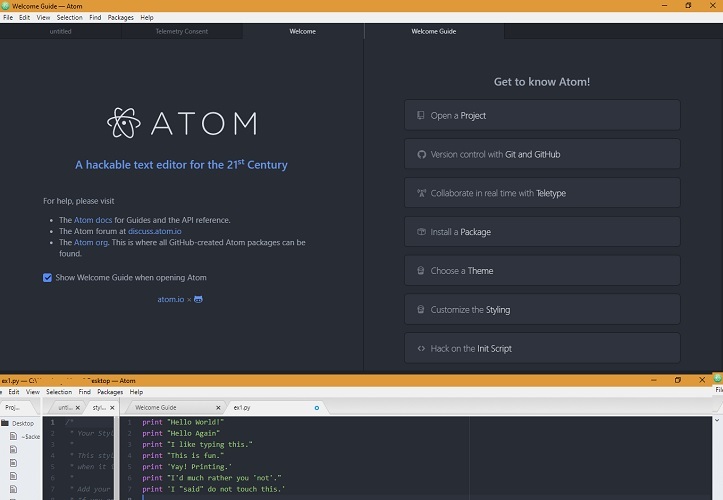 If you’re looking for a Python text editor that contains the “cheats” to every problem you can imagine, Atom is the best fit. In fact, they consider themselves a “hackable” text editor for the 21st century. This free and open-source community, backed by an MIT license, is like the Wikipedia of Python codes. There are over 8000 packages you can install from the Atom website. Besides, they even have a Slack community where you can find help and collaboration for your projects. 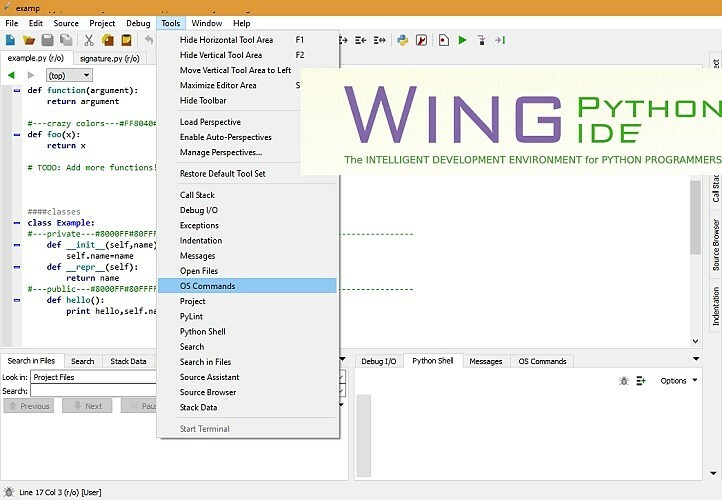 Another IDE, Wing Python, is a really premium editor which leaves no feature behind. Its personal edition is free but not limited by features. Moreover, you can use all the basic purposes including auto-completion, syntax highlighting, indents and debugging. A full-featured professional version costs $245/user/year for commercial use, which is far too expensive. However, it contains advanced features including a powerful search engine, Django and other framework support. Compared to PyCharm, it does not compare very well, though, even after charging more money. However, one of Python’s guiding mottos is to make codes beautiful. In this case the interface is clean and minimal, which allows for beautiful codes which take far less time. 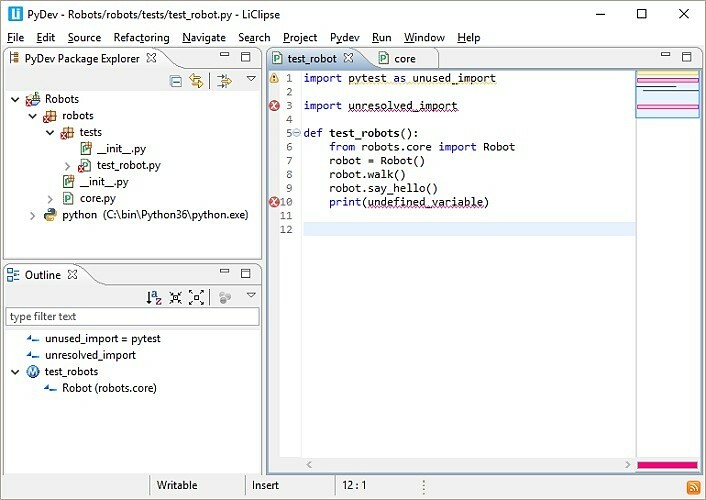 PyScripter is a very new version environment for Python, and its latest stable version was released just two months ago. It is completely free and open source and extremely lightweight, unlike the premium IDEs. The compliler comes with all basic features of a coding platform and can serve the needs of beginners as well as experts. All programs are seen in the running window, and you can run them multiple times to check for bugs. Again, this is one of the best free IDEs out there, and you will not be disappointed. Spyder is a well-known free IDE with a full extension library and complete features. Komodo IDE is a powerful tool for Python developers, but they are well-known because of enterprise customers. According to the developer community at StackOverflow.com, Python is the fastest growing major programming language. This fits correctly with its increasing use in Internet of Things and Big Data applications. 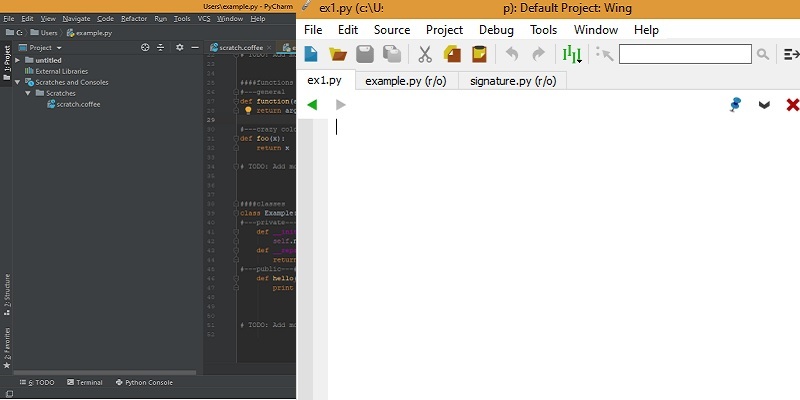 Working seriously with the Python software program requires access to a best-in-class IDE. Indeed, no matter which software you use from this article, you will not be unhappy with the results. Do you have a personal favorite? Please let us know in the comments. If Atom is mentioned, then I suggest also adding sublime text. Sublime Text is definitely a smart editor. But it’s kind of closed source as they vigorously cover that thing with copyright protections. With other paid Python text editors, you can freely use the code you created across other projects even if you don’t pay after free trial. Python codes should be free forever. Do feel free to disagree. Want to hear your views on this. I understand where you are coming from and I appreciate you taking the time to explain. You got this right — PyCharm is, by far, the best of the best as an IDE. It’s really easy to use and has pretty much everything you will ever needed. The others aren’t that good. Atom is such a nightmare to get the packages to behave. Definitely not worth the time! Thanks for your feedback, Ken. IMHO Thonny (https://thonny.org/) is the best Python IDE for a Beginner. I really like PyCharm but the company I’m working for can’t use it for security reasons because the company, JetBrains, is a company in it Czechoslovakia. Czechoslovakia? That country does not even exist anymore. And why would it be a security issue – if you mean Czech? Why vscode did not make to this list? Have you considered Visual Studio Code? Take a look at https://code.visualstudio.com/docs/languages/python or try it out. You may be pleasantly surprised. Oh, and it’s multi-platform, free, open source and very actively maintained. Definitely worth an honorable mention – if not a top 5 spot IMHO. Thanks for your input. Visual Studio is extremely popular and its debugging feature is a delight.